Summary: Things went exceedingly well. There were some hiccups. I learnt some lessons. 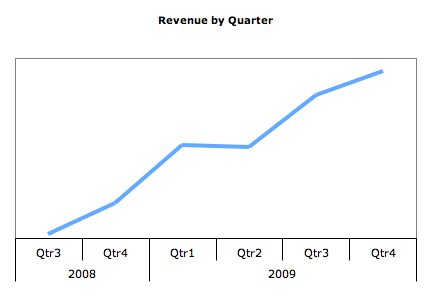 Each quarter has been significantly better than the previous except for 2009 quarter 2. I’m pretty sure that anomaly was because I announced I was working on Poker Copilot 2, leading many potential purchasers to wait. What a way to scare off potential buyers! Monthly expenses have remained almost negligibly low. Over the year I went from being a full-time IT consultant to a part-time IT consultant, to giving up consulting altogether. Poker Copilot earns me a good income for Germany, where I live. I work nice, flexible hours. I’m far more satisfied with my work compared to consulting. I released version 2. I released it too soon out of eagerness and there were quality issues. While trying to solve those initial quality issues, both of the major Mac poker rooms made changes that broke Poker Copilot. Trying to deal with quality issues AND make fixes for the Full Tilt and PokerStars changes lead to a painful and somewhat embarrassing couple of months where I felt like I was doing nought but chasing my tail. Since then I’ve made a forceful push towards better quality, better testing, and better processes. I mostly did this but sometimes I failed on either the first count or the second count. …will be in a separate blog post soon! I’ve got lots of good stuff planned.